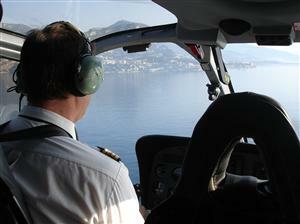 Helicopter ride from Nice, France to Fontvieille, Monaco. 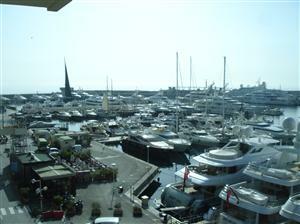 Man, after 29 hours of traveling I finally arrived in Monte Carlo, Monaco! Lets start off on Saturday, April 9th. I had the pleasure of being dropped off at the airport by Adam and Sami! I got to Seatac around 7:20pm and about 2 hours later I was on the plane to JFK. I was out for most of the flight. We landed around 6:06am April 10th in New York. 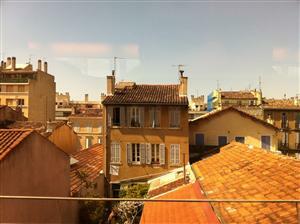 I FINALLY LAND IN NICE, FRANCE! 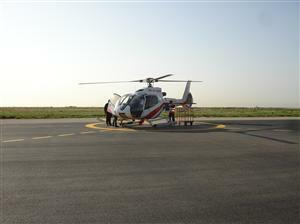 as we are pulling up and this was very exciting for me since It would be my first time flying in a helicopter. 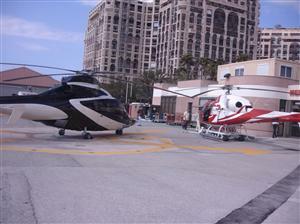 There are 7 ways to get to Monaco: Walking, Biking, Train, Taxi, Limo (ok same as taxi but much classier), Helicopter, Yacht. 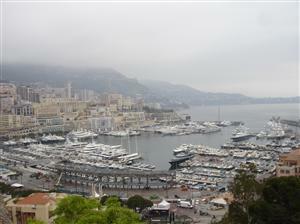 I think next time I'm here I'll take a Limo to Monaco and a yacht back to Nice :). 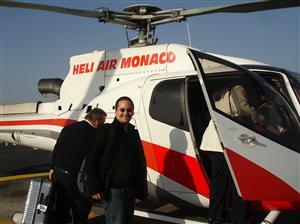 So I chose to arrive by helicopter for my first time to Monaco! The view from the helicopter was beautiful! 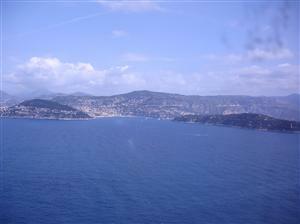 Flying over the Mediterranean Sea with the French Riviera to my left was breath taking. We landed in Monaco and a driver took me to my hotel. 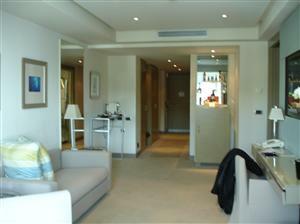 I'm staying at the Port Palace Hotel in a Harbor-side Grand Suite room 501. This room is beautiful! Two rooms, one being my bedroom, and a very nice bathroom. My bathroom has a jacuzzi type bath, a walk in shower and a separate room for my toilets. Yea that's right, plural form of toilet I believe one of them is a bidet lol. The view from my room is spectacular! The harbor is gorgeous with all the triple decked yachts; I can't believe I'm here. I checked in around 9:40am and got to know my room. I decided to stay in and just relax after having been in airport-mode for the past 29 hours, 38 hours if you include all the time-zone changes haha. Lucky for me Monaco is a very small nation so I'll be able to see most if not all of it tomorrow. I fell asleep around 11:am and slept until 7:30pm-ish. I woke up sent some pictures to Sami and made a few calls to Adam, my dad and then my mom through my local Gmail voice number, my netbook and the hotels wifi :) The connection was very low so most of my calls started very well but ended roughly. Overall it worked! So now it's 11:23pm Monday night in Monaco and I just finished a pizza and watching a soccer match on tv. I think I will shower off Seatac and JFK and call it a night. Wow so today was quite the day! I was up around 6:30am which is waaay to early to be awake but hey at least I got a good start on the day! I left my room around 8:00am and hit the town. 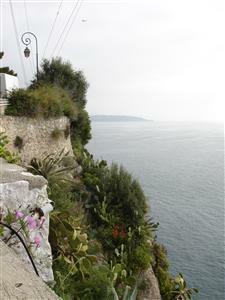 and the Monaco shoreline. The morning was a bit overcast but warm nonetheless. Around 10:20 the clouds around the mountain tops dispersed and the skies cleared up allowing the sun to drape over Monaco. around 11:20am I started back to the Palace. I saw a line of gift shops so I stopped by to see if they had spoons. 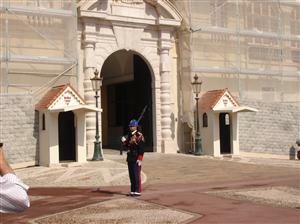 I now have a spoon from Monaco :D. By 11:30am it was getting very very warm and standing in front of the Palace waiting for the Changing of the Guards Ceremony was becoming my least favorite thing to do. Around 12:00 noon It was finally over and I was on my way back down the cliff to either a) find some food or b) find the Casino. I chose option 'a' but not after getting lost again and taking more pictures of things. I ate at my hotel, it was sooooo pricey! God I kinda regret it but it was veeery delicious lol. I sat around my hotel for while after eating; I was very tired from walking. Around, uh, crap I forgot when, I think 1:30 ish, I was back out and went to find the Grand Casino of Monte Carlo. This place was beautiful unfortunately I wasn't allowed to take pictures while inside. 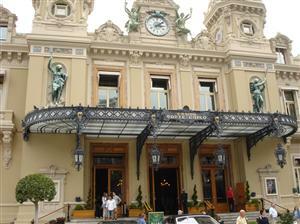 I walked around that general area of Monte Carlo taking picture after picture of the everything. well around 5:00pm I was back at my hotel. I was about to call my god mother which I did around 7:00pm, 10:00am PST. I After talking with her I decided to take a nap between 8pm and 9pm then head back out to one of the casinos I saw across the street from the Grand Casino. I ended up sleeping through my alarm waking up at 11:00pm. I got dressed and headed back out. Monaco is lovely at night. All the lit up buildings and yachts ah amazing. I got to the casino and dropped 40 euros at the blackjack table. Don't worry I was up for most of the time but I wanted to go through my limit. That was my very first time gambling and I did it in Monaco of all places :D. After losing I felt like a drink so I headed off to the Buddha Bar just around the corner. A nice dark place, I ordered my drink and sat one of the tables. So about 10 min later two lovely ladies sit next to me. After 20 min and me paying my bill the girls and I start chatting. They were from Poland and apparently live there and in Monaco 6 months at a time. After telling them I'm staying at the Port Palace and was American they asked if I would like some company. haha, I said company sounds like fun, you guys looking for fun? A couple minutes later they hint that they are working girls. I knew it. I chuckled and told them I have no money. They said "but you are in Monaco ;)" then offered me a discount. I told them "I have no money which is why I'm heading back to Nice in the morning." I then slowly stood up, grabbed my jacked, kissed their hands telling them it was a pleasure meeting them and left the bar. Well that was around 1:30am It's now 3:13 am I had just called my dad, Adam/Sami, my mom and chatted on facebook. Gonna upload the Monaco photos and call it a night. My bus is picking me up around 10:35am to bring me to my helicopter and then it's back to Nice, France! So today is the day I leave Monaco :( I had a blast here and will definitely be coming back. Maybe look for a place to live when I do! I woke up around 9am showered and checked out about 10:35am. A van was waiting to take me to the heliport. My flight back to Nice, France was at 11am. Man, I love helicopters! So convenient. 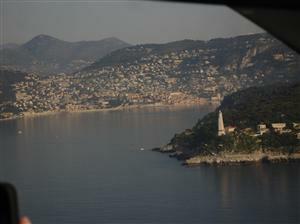 Anyways, The ride was just as beautiful on the way back got a few more pictures of the French Riviera. So now I'm back in Nice at the airport. I got some more euros and then grabbed a taxi to my hotel. This hotel looks cool from the outside but the room is crappy. Well.. compared to my last room haha. The AC in this room doesn't work so I had to open my back door and my front door to get a cross breeze in. Oh speaking of back door, when my back door is open my ceiling lamp drops as in the part that is supposed to be attached to the ceiling hangs loose... And when I close my door it slowly moves back up to the ceiling... weird as heck. Oh and on another note... the view from this room is just spectacular! I'm at theLe Royal Hotel in a sea side room. 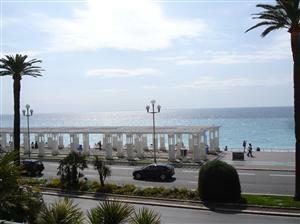 It's right on the Promenada Des Anglais so there is only a street and a beach between me and the sea. Anyways, Today was just a chill day since I'll be back for three days. I did walk around though, got dinner which was alright. 19 euros got me a huuuuuge pile of muscles cooked in white wine, two things of lamp with french fries and a cooked tomato, and two scoops of ice cream for dessert. haha French Fries in France. They were actually very good probably better than in the states. Except for in-n-out of course. but there are way too many people. Oh well! I got back to my room around 5pm and decided to relax till it got cooler and darker out maybe 8ish head back out. I set my alarm clock and crashed. Well, I ended up waking up around 3am :/ meh so I went back to bed. I'ts now 8am and I'm up and getting ready to check out. 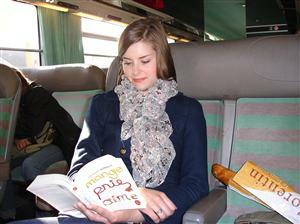 I have a 6 hour train ride to Dijon today :) then I see Courtney tonight! It's going to be weeeird. haha. Well it was a pretty simple day. We're meeting up at 1pm tomorrow. 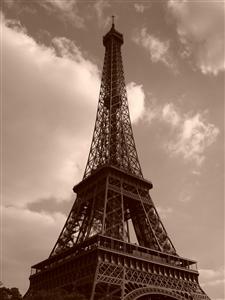 And then we're off to Paris the next day! So today was the day I got my tour of Dijon. I woke up around 10am and got a message from Courtney saying that her meeting at 12:30pm got turned into a surprise lunch for all the girls since everyone will be leaving for Spring Break. She said that she should be done by 1:30pm so she's heading to my hotel at 2pm. I have become really hungry since waking up so I decide to go find a bite to eat before meeting up with Courtney. The whole time I've been in France I've imagined Subway being really good here. I finally found one by my hotel and well It was alright. Nothing special. The cookies were still very good so that was satisfying. I forgot to trim up my facial hair before my trip and it has become a little overgrown so I walked into the first hairdresser I came by and pointed to my chin and somehow got an appointment for 2:50pm or so I thought haha. It turned out to be 12:50pm and I totally missed it. Anyways it's still only 11:30am or so and I'm just walking around Dijon taking pictures of the city. 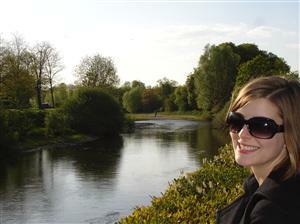 It's really pretty here especially around Notre Dame and the Duke's Palace. I kept walking around and eventually got myself lost for about an hour and a half. Finally I come across this fountain I recognize. It's almost 2 so I decide to sit on a bench and relax some. So 1:50pm comes around I head back to my hotel and at 2pm Courtney shows up. She and I chat 'till it's time to get my haircut. We show up and after figuring everything out Courtney gets me another appointment at 4:45pm :) She and I walk around Dijon, visit a couple churches, a crypt, some historical streets/areas and I'm snappin' photos left and right. Courney showed me this wooden owl where one is supposed to place their left hand upon it and make a wish. Then you are suppose to walk in this specific direction or else you'll pass this wooden carving of a dog and the legend has it that if you walk back this way the dog chases after you and takes away your wish. I don't know about you but I prefer to keep my wishes so we walked in the safe direction. We then end up at a park sitting, chatting and then talking about what we'll be doing while in Paris tomorrow. 4:35pm comes around and we head to the hairdresser's to tackle this task. Overall it went smoothly all I really wanted was my beard and mustache trimmed a little it was getting too long and annoying. Afterwards we head to a place to get our train tickets to Paris then we go for a walk around town and end up at another park where we sat for about an hour chatting about Paris. For most of that time this man was running like a retard (not to sound mean but it's the best way to describe it) haha. He was like grunting and running flapping his arms around then he would walk back to this bench, sit for about 5 min then stand up and run again. It was cracking Courtney and me up. This park was beautiful. It was practically a forest with a few roads going through it and a few open patches of fields or play areas for kids. Very peaceful. It's about 7:30pm now and time to eat so we get up and head back to the main part of town to look for a place to eat. We find this little authentic restaurant and well I ordered what I thought would be a casserole sorta dish but it turned out to be nothing like one. It was alright but I wouldn't order it ever again haha. We finish eating and end up talking for about another hour after dinner. I walked her back to her place, said goodnight and now I'm back at my hotel after getting a LITTLE lost. Well I should head to bed soon. I have to be up by 6:45am to get ready for Paris. Meeting Courtney in the lobby at 7:20am and our train departs at 7:46am to PARIS! Tomorrow is gonna be a blast. Oh and today was PAYDAY!!! So I have even more money to spend in France. w00t. get to see soo much of country the way the land changes the closer you get to a city. You see all the little villages and just beautiful landscaping. The journey was about 3 hours but it went by very quickly. Courtney read her book and I gazed out the window while listening to music. We arrived in Paris around 10:44am and decided to go get our return tickets to Dijon while still at the station. I had missed the second confirmation code when purchasing our round-trip tickets. I for some reason thought I had one code for both legs of the trip. So it didn't go very smoothly while trying to retrieve our return tickets. For some reason (maybe the lady was just on the wrong screen) no return trip was coming up even under my last name. This was completely wrong because I know i had purchased a round-trip ticket. Anyways after getting my return ticket to Nice printed out just to have it, I was just about to buy a one way ticket back for Courtney and me when she convinced me to figure something else out. So I got on my phone, logged into my email and found the email with our confirmation codes. haha it was there all along, we plugged it in a kiosk and tadaa printed out our tickets. Okay all set now it's off to see PARIS! I really only had a few things I really wanted to do: See the Louvre and the Mona Lisa painting, see the Eiffel Tower and eat a real crepe in Paris. On our way to the Louve Courtney and I crossed this bridge where couples write their names on locks and then attach the lock to a link on the fence. 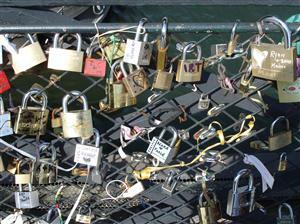 There were two fences covered with these little pad locks on two difference bridges. 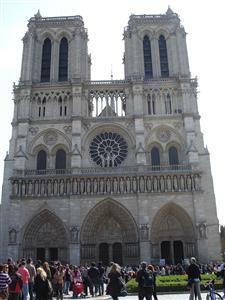 After crossing the first bridge our first stop was at Notre Dame. This one was really big and gorgeous. It looked just like the one from the movie haha. After a few photos there we walked to the Louvre. The line to enter the museum was pretty long but it moved quickly. The outside was amazing. So beautiful and the buildings were just breath taking. I love every inch of this place. After several minutes of standing in the heat, it was getting very sunny and warm by now we were finally through security and inside the main area between the difference exhibits right under the Louvre pyramid. 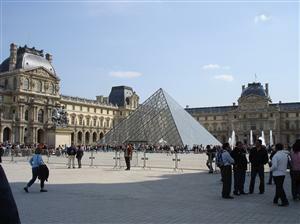 Maaaan talk about greenhouse effect it was so hot right underneath the Louvre pyramid. Anyways I got our tickets to enter the exhibits and then we were off! 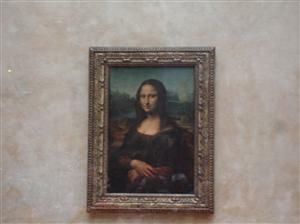 We walked through a statues hallway then some paintings and then it we turn the corner and there is the Mona Lisa! It was very cool I don't care what others said I loved it. I finally got a nice picture of it, no one else is in it :). After my time with Mona Courtney and I walked around some of the painting exhibits. There are some very interesting events being depicted. Well after only spending an hour at the Louvre we head out and walk towards Arc de Triomphe. I got a couple pictures there and by this time we are getting a little hungry. Since we are still quite some distance from the Eiffel tower we decide to take the Metro over to it. 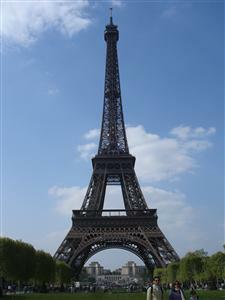 The Eiffel Tower is soo cool up close. Pictures don't do it justice. The moment you see it up close you finally begin to realize that you aren't in Tacoma anymore but in frickin' France. We walk all around the tower and then start lookin' for a place to snack. We end up at the little restaurant where we had a wonderful view of the tower. Courtney and I each had her favorite salad which is a green salad with toasted pieces of bread and warm goat cheese on the bread and a Dijon vinaigrette dressing it was veery good. I also had a Kir Royal which is Kir Liquor and champagne. It was also quite good and it's a staple french drink I was told. The whole meal was amazing oh and the day was perfect! Sunny, warm, breezy, clear with just a couple puffs of white clouds in the sky. We couldn't have asked for a better day. It's now almost 4:30pm and I still want to get my crepe so we walk around the other side of the Eiffel Tower and I get my very first crepe. Courtney and I both got a crepe with banana and nutella. It was gooood. 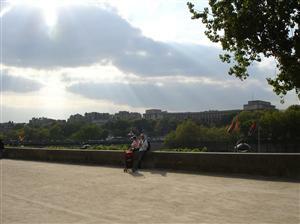 We ate them along the river with the most spectacular view of the water, the other side of Paris and the Eiffel Tower. Well our train back to Dijon leaves at 7:45 pm ish so we start our walk back. We are really far from the train station but we figure we can make it. after 2 hours of straight walking along the side of the river we decide to take the metro the rest of the way; we didn't think we would make it in time and having to stay the night in Paris wouldn't be good. After 10 minutes or so of trying to figure out where the nearest metro entrance was and then trying to find the correct train we finally find the two connecting trains to get us right inside the station or at least very close to it. We barely made the second train do to lots of people trying to also get on board and arrive inside the train station around 7:23pm. Courtney and I look at our tickets to see what train number we are on so we can find our what platform to head to... Well... looking at our tickets we find out that our train leaves at 7:28pm NOT 7:45pm... We had no idea what we were thinking... Well I spot our train number and it's at gate 11. I look and find 5 a 26 or whatever and that was gates 5 to 26 or whatever so now Courtney and I are running and these platforms were waay the heck out there. We run and get to platform 11 around 7:27pm quickly jumped on anywhere and then started to look for our carriage then seats, Courtney then jumps off to quickly ask someone that works there if we were in fact on platform 11 and that this train did stop in Dijon. The answer was yes, Courtney jumps back on, we get to our carriage and the trains takes off. Wow, a minute later anywhere along our journey and we would have missed this train. Some girl was sitting in Courtney's seat but after showing our tickets she got up and left and Courtney and I were on our way back to Dijon. We got back home around 9:07pm. I dropped her off at home and said goodbye in case I didn't see her tomorrow since she has a lot to do before Spring break and her family gets there. I'm not in my hotel and kinda bored. In a weird mood but it's okay. 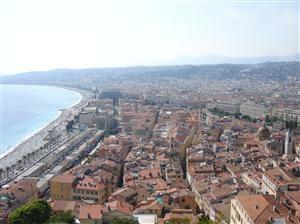 I'm kinda dreading going back to Nice I've had just a great time here. 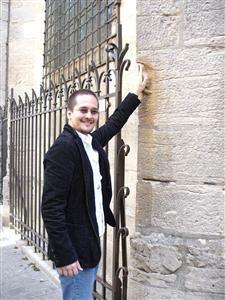 Well, I still have tomorrow to walk around Dijon I plan on going to the Musée des Beaux-Arts which I hear is wonderful. I really hope to see Courtney again tomorrow but if not meh oh well! Today sucked. I had nothing to do at all. I did visit the Musée des Beaux-Arts and it was cool but I just wasn't in the right mood to fully enjoy it. I didn't get to see Courtney today because she had to pack, skype, and prepare for her Spring break because her family will be coming to France. I wish I had known before getting my train tickets so I could have left today instead of having to sit around waiting for tomorrow to come. I leave for Nice tomorrow morning which I'm also not looking forward to but meh I can't fix that either unless I want to spend money which isn't a problem It's just I don't want to. I think I'm all "Franced" out. Too many couples here it's annoying. I think I'll stick to less romantic places for future trips like the middle east or Northern Africa while I'm stuck being single haha. Well it's now 11:04pm, I'm all packed for leaving and just sitting in bed watching a muted soccer match on tv and listening to music play from my phone. I've played like 12 games of Yahtzee could tonight get any more pathetic? So glad I'm blogging about all this. I wouldn't want to forget special moments like tonight grrr I'm so bored. 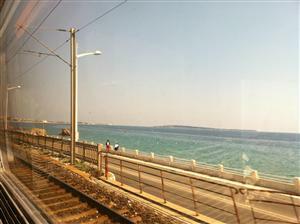 So I caught the train this morning back to Nice. The 6 hour journey once again went by really quickly. Well nothing happened during these 6 hours. The views were amazing I missed most of the country-side ones due to strategically places trees and hills but as we got closer to Marseille, Cannes and Nice I happened to snap a few coastal and city pictures. 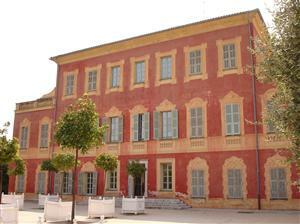 I am in love with the buildings here in France I just think they are beautiful! It was a very sunny day and got even more so the more South we got. Luckily down in the French Riviera there are less trees and hills to get in the way of my picture taking so I was able to snap a few photos of the coast. 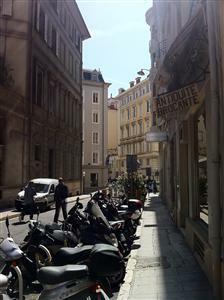 I arrived in Nice around 3:30pm then caught a taxi and got to my hotel around 4:15pm. 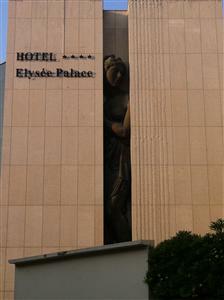 I'm staying at the Hotel Elysee Palace in a Sea-view Junior Suite but the Sea view isn't all that great. 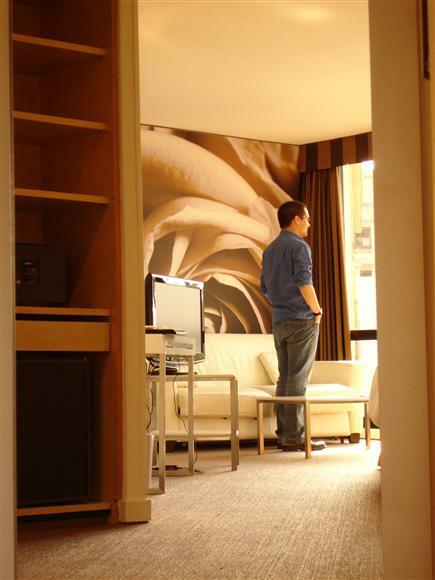 The room is very nice and the hotel over all is just great. The site even has a weird thing goin' on that I just had to take a picture of lol. Well I walked around a little today but I didn't really see anything new. I got lunch which was this green salad with bacon, mushrooms and mustard sauce but I now know when I see "mustard sauce" it really means they just dump mustard all over it eeh it was too strong; it should never be a tough task to finish a salad. I got back to my hotel around 7 tonight and just relaxed for the rest of the night. 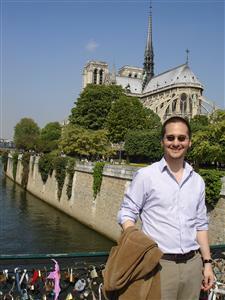 Made some calls and uploaded all my France photos to date. Well I'm calling it a night. Well today was my last full day in France and I must say it was awesome. It was a beautiful day I wouldn't have changed a thing and I took lots of pictures! To start off the day I woke up at 10 then snoozed till noon :D I wanted to visit the Matisse museum today so I got up, showered, made myself an espresso, checked my email and headed out to find a taxi. There are a lot of female taxi drivers here haha just something I noticed. 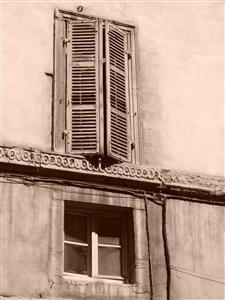 I couldn't take pictures inside the Matisse exhibit but it was housed inside the building Matisse had once lived in... I think.. I'll look into that. Anyways, I took a lot of pictures of the building. The exhibit was quite small so after I went through it I decided to walk south to the Museum of Chagall. 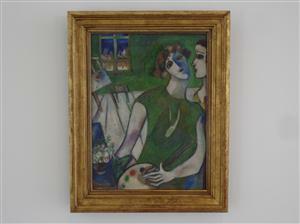 Chagall painted some very interesting pieces. I would say about 80 percent of the paintings I saw were of the 'woah' factor. I did particularly like one painting and luckily I was allowed to take pictures in this museum :D.
After Chagall I did a LOT of walking around the old town taking pictures left and right. I was just in "awe" of the coast line. I wanted to get some pictures of Nice from up above so I found my way to some stairs. I looked around and found a tunnel that led to a lift. whew. Well, the ride up was funny, some ladies were in there with me and one of the older ones had one too many buttons unbuttoned. One of the other ladies mentioned it and now I don't speak French but I'm pretty sure she replied back, while buttoning up of course, 'oh I don't hear him complaining.' haha anyways by the end of the ride I'm pretty sure we all were a little closer haha. So the views from up there were spectacular. I found a path that got me up higher and actually lead me to a castle. The panoramic views were perfect from the very top. Well After a few more hours of picture taking I ended my day in the hotel bar. Well actually after there I decided to go for one more walk along the beach. It was about 7:00pm the sun was setting and it was starting to get pretty cold out. The beach was beautiful and there weren't that many people out. Actually there weren't that many people out the whole day compared to my very first day in Nice. There were though a lot of people gathered around the main shopping street but I only passed through there very briefly while I was temporarily lost lol. Well I depart tomorrow morning at 7:55 am to Paris and then at sometime after 10am I depart to Seattle where I'll be landing around 11:50am and have to be at work by 2pm. blah.